Nothing captures a vintage vibe better than cool neon! 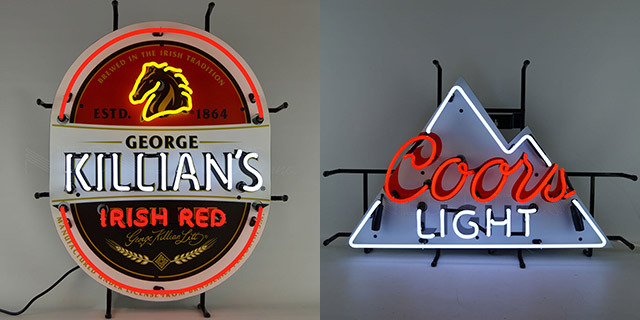 We just launched a batch of new neon clocks and signs that take you back to the golden age of advertising. 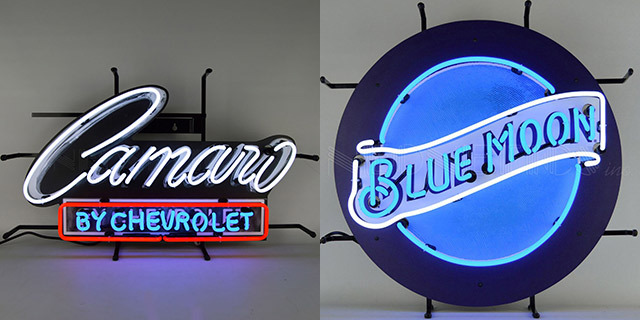 You don’t have to own a business, either; any of these neon products will enhance the look of your game room, garage or man cave. Our new neon clocks are an affordable way to add a retro look to any room, but you’ll notice a definite slant toward the suds! 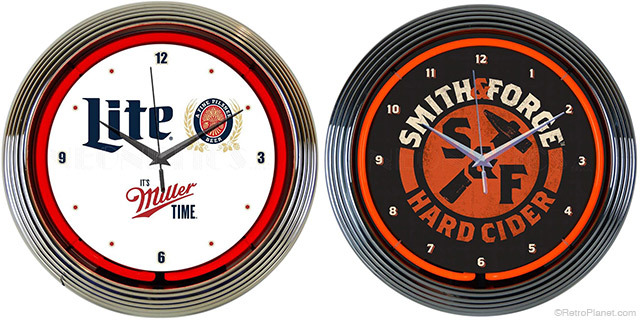 Each wall clock features a vintage-style graphic protected by a clear glass face, and surrounded by a beautiful, 25-watt neon ring. The light color varies with the clock you choose, but all feature a heavy-duty plastic body with a cool deco design and shiny chrome finish that enhances the vintage look. All you need is a standard wall outlet for the neon, one AA battery for the quartz clock, and you’re ready to step back in time! Working with a bigger budget? You can really make a statement with a big, bold neon sign. Among our eight new additions are classic car and beer designs, all with two neon lights powered by industrial strength transformers. The hand-bent neon tubes are mounted to a tough metal frame that’s designed for maximum display flexibility. Mount your sign in a window or prop it on a shelf, whatever works for your decor. You just can’t beat the look of nostalgic neon, and we’re excited to offer these great products to all you retro enthusiasts! 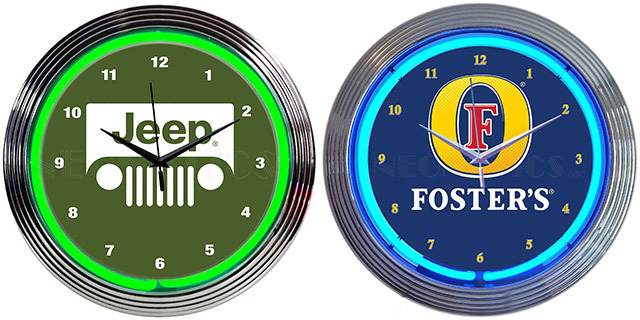 Check out these and all our other gorgeous neon clocks and lighted signs.